If you like spicy food, this one’s for you! By the time I was done eating these mussels, my mouth literally felt like it was sprayed with mace, doused in battery acid, then blow-torched. I went heavy on the crushed red pepper, but you can certainly add less if you prefer less heat. 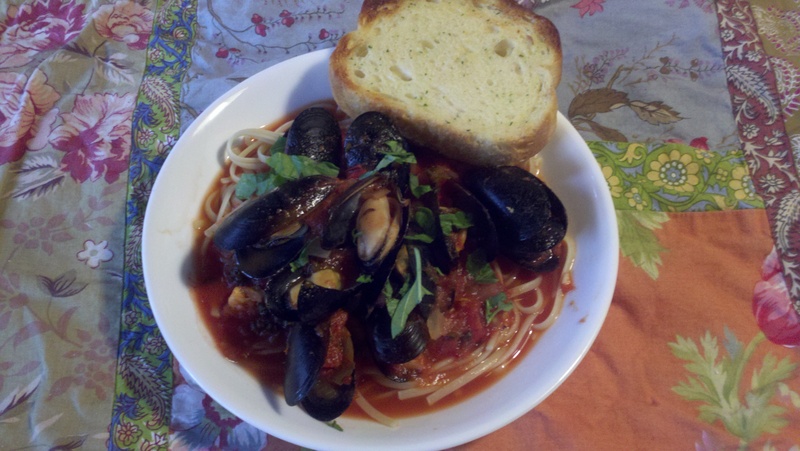 I just happen to like it HOT- after all Fra Diavolo means “Brother of the Devil.” Enjoy! Drizzle a bit of olive oil in the bottom of a large stockpot and preheat to med-high. Add the onions and garlic and saute until tender. Add the wine and work any caramelization off the bottom of the pot with a wooden spoon. Add the can of crushed tomatoes, fresh tomatoes, whole carrot, parsley, oregano, red pepper, salt and pepper. Bring to a boil then cover and let simmer for about 30 minutes. Remove carrot (I eat the carrot for a snack) and add mussels. Recover and raise the heat allowing mussels to steam and open up, about 5-10 minutes. Discard any mussels that don’t open. Serve over pasta if desired. Serve with crispy toasted bread, definitely.